Figure 1. Step access to truck cab. Fatigue is a well known form of progressive damage. Repeated use of parts at relatively low loads, sometimes less than half of their overall strength, can result in a time delayed catastrophic failure. Fatigue failures can be particularly dangerous because there is little warning of the accumulation of damage. 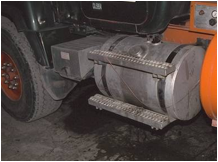 A thin metal strap supporting the truck cab’s access steps (Figure 1) had reportedly failed, injuring the driver. The failed part was destroyed before it could be examined, but based on the description of the accident, and the delayed nature of the failure, fatigue damage was suspected. The straps were made of steel, and were fastened to the aluminum diesel fuel tank. The design of the straps was checked for susceptibility to fatigue damage; this included strain gage testing of identical straps in service, and the use of specialized fatigue design software to predict their lifetime. The strap design was found to have infinite life when subjected to a repeated 200 pound stepping load in combination with a 2 g road load. Given these conditions, we concluded that it could not have suffered a fatigue failure, and that the design was adequate.